Earlier this summer one of Corfu’s most luxurious hotels the five-star Marbella Beach Hotel saw a visit from the Fabulous Baker Brothers, Tom and Henry Herbert as featured on Channel 4. The Bristol based brothers are the famous faces of the family business Hobbs House Bakery. Tom, the elder of the two won his first claim to fame after winning Young Baker of the Year after leaving baking college. Henry, a fully-fledged butcher left his job as Head Chef at an award-winning pub to head-up Hobbs House Butchery. These culinary professionals and their wonderful families travelled with Classic Collection Holidays this May to the outstanding Marbella Beach Hotel. With their love of food always in mind the Fabulous Baker Brothers were keen to show their interest and their knowledge with the hotel’s chefs. 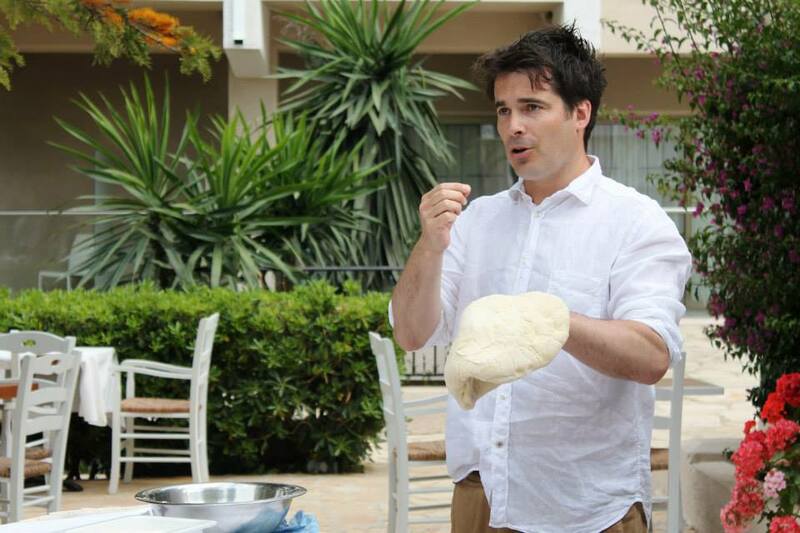 With baker Tom at the helm they took part in a cookery demonstration making Traditional Greek Flatbread Pizzas. The brothers were also invited to create a dish for the Marbella Beach Hotel menu, a true delight for all the guests there. The dish was a Corfiot Pizza, a fusion of Greek and Italian cuisine which toppings consisted of figs, goat’s cheese and fresh rocket – all I can say is, where’s ours? With brilliant sunshine and temperatures in the 20s the Baker Brother’s and their families enjoyed the hotel and the island to its fullest. The families were welcomed aboard the Marbella Beach Hotel’s newly launched Private Speedboat Excursions. What better way is there to see and explore Corfu than on a luxury speedboat? The hotel’s friendly and knowledgeable skippers welcome many itinerary suggestions to ensure that you make the most of your time on the water. Sample itineraries provided by the hotel include Vidos Island, a Culture and History tour. Guests will speed towards Corfu Town passing the old Kaiser Bridge, the Achilleion Palaceon and Mon Repos (the birthplace of Prince Phillip), on the way. You will then visit Mouse Island where there is a chance to hop off. After a spot of lunch and exploring of Vidos Island you will head back to the hotel. Equally the Molos Beach, Natural Beaches and Delightful Taverns option will see you visit Molos beach and enjoy the local picturesque taverns. Should you also want to, the skipper would be more than happy to stop to allow you to swim and snorkel in the beautiful Ionian Sea. The Private Speedboat Excursions cost around €400 plus fuel for two persons (exact costs are calculated at the end of the trip taking into account fuel consumption and time). There is an extra charge of €50 per person for ages 12 and above, (children aged 4-11 go free and the service is not recommended for children under 4 years). Up to a maximum of 6 persons per trip. During a brief pause from enjoying the sun and azure waters, the Fabulous Baker Brothers made time to offer guests at the Marbella Beach Hotel a book signing of their latest publication, The Fabulous Baker Brothers: Glorious British Grub, which accompanies their latest television series. The five-star Marbella Beach Hotel is the perfect example of a hotel which suits everyone. Situated on a wooded hillside overlooking the sea, near the tranquil village of Agios Ioannis Peristeron, it is the perfect location for luxury Greece holidays. Boasting its own private beach the hotels offers its guests luxury and exclusivity through every aspect of their stay. This fabulous hotel is renowned for its excellent facilities for families with two separate children’s pools, a range of watersports, daytime activities and outstanding kids clubs provided by the distinguished Worldwide Kids Company. Couples too will enjoy the hotel’s delightful spa with a range of massage and beauty treatments, three outdoor swimming pools and sumptuous a la carte restaurants and bars.